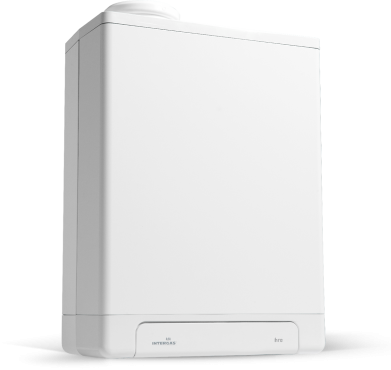 The Compact HRE OV boiler is a regular (conventional) boiler which has been designed and manufactured by Intergas to replace your existing regular boiler. It is a highly reliable condensing model which is mounted on the wall in your home. The boiler will heat water for your radiators and, when combined with a hot water storage cylinder, will produce hot water for your taps. A regular boiler also requires a cold water feed tank to be located in the attic so this boiler may not be suitable for some smaller properties. This boiler has an efficiency rating of 88.9% which merits it a SEDBUK rating of B. The size or output is 23kW making the unit perfect for the properties with one bathroom and a low to to moderate hot water usage. The constantly modulating fan automatically adjusts the capacity of the boiler to your requirements helping to ensure no valuable energy is wasted. This boiler has no air pressure switch and is an easy to service and easy to maintain unit. It has almost no standby losses and has the option of either a horizontal or a vertical flue. This unit also features a 10 year warranty on the heat exchanger and a 7-year warranty on parts (subject to return of the warranty card).